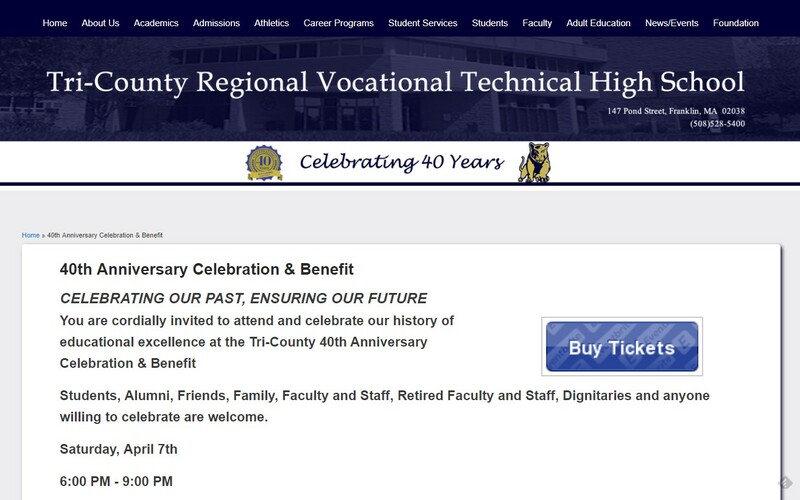 It's been forty years since Tri-County Regional Vocational Technical High School opened its doors to students seeking a vocational education in Franklin, Massachusetts. In 1977, students were seeking vocations in programs still offered today including automotive technology, carpentry, electrical wiring technology, cosmetology, plumbing and graphics to name a few. Since then, those programs have increased to include dental assisting, engineering technology, computer information systems, and legal and protective services. Today, Tri-County serves over 1000 students from eleven towns and offers adult education for all interests including postsecondary programs, various licensing and certification courses, or offerings for people just looking to have fun. The high school is looking forward to celebrating the anniversary with alumni, students, staff, as well as business and community members. "This is a year to celebrate Tri-County," said Stephen Dockray, Superintendent. "I'd like to personally invite alumni, retirees, current faculty, parents and friends and members of the community to join us to reminisce with old acquaintances or make new ones, while celebrating this memorable night. Come and visit the school, see the vocational shops, and celebrate everything that is amazing at Tri-County." The 40 Year Celebration and Benefit is scheduled for Saturday night, April 7, 2018 from 6:00 to 9:00 PM at the high school. The suggested donation is $75.00 per person. Part of the donation includes a benefit component. Any proceeds will go to the Tri-County Education Foundation, a non-profit 501(c)(3) charitable organization dedicated to enriching and enhancing educational opportunities for students. For example, providing funds for student competition travel. "We hope to see you on April 7th for the celebration and the opportunity to give back to our students," said Dockray.